LAKELAND – Dr. Robert “Bob” Tuttle made his peace with the seemingly incongruous statements of the Bible a long time ago. Most of them are really just admonitions people would prefer to ignore. 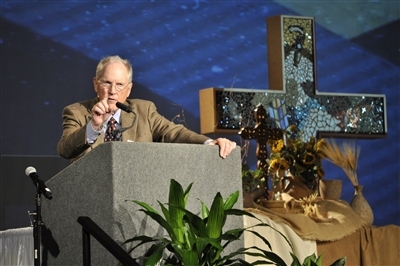 “You might not want to hear this,” Tuttle told listeners at a Thursday morning Bible study that kicked off the second day of Annual Conference 2014 at The Lakeland Center. Dr. Robert "Bob" Tuttle leads Bible study on the second day of Annual Conference 2014. Photo by Steve Wilkinson. It was old-school, in a way, for much of the crowd, many of whom studied with Tuttle, now professor emeritus at Asbury Theological Seminary. If listeners were averse to his message of putting aside self-interest and focusing on the welfare of others, it wasn’t obvious. They rose to their feet in applause when he left the stage. He recalled the self-sacrifice of early Christian martyrs and later Methodist missionaries persecuted and even killed for their passionate belief in Jesus Christ. To expect rewards in this world, even in today’s modern church institution, is to forget the advice offered in the book of Luke and other gospels. “The best opportunity for greatness is to be appointed to some little church or parish that nobody else wants, where your only hope for any measure of success is to rely totally on God,” Tuttle told pastors and aspiring clergy. Tuttle’s message was not tailored only for clergy. Most conference attendees grew up in a land of great wealth, he pointed out, a nation where corporations profit from laying off employees and the plight of impoverished people here and across the globe is easily ignored. “Shame on us!” Tuttle said, calling on listeners to pray for American and world leaders to “cease this endless pursuit of wealth” and consider the welfare of the vast majority of people who live without hope of a better life. While it may be difficult to make sense of Luke 13:30 by observing the world, the truth of the scripture lies in the power of God. “The perfect will of God is constantly being updated and renewed … so the first can become last,” Tuttle said.